Pharmaceutical Packaging: this article retraces the history of packaging - how it originated, what are its characteristics and trends for the future - to understand how it became a key issue for the pharmaceutical market. In our previous articles we have already discussed packaging issues. The topic has been explored with new trends for the year and especially new trends for pharmaceutical packaging. In this article, we will explain to you additional but essential concepts to know everything you need about pharmaceutical packaging! tertiary, useful for the transport of various sales units or multiple packaging. But let's go into detail and focus on packaging for the pharmaceutical market. It's important to know that primary and secondary packaging have a significant direct effect on the efficient management in the medical-hospital field. Primary packaging: it has to guarantee safety. It's a double protection to avoid possible damages to the medical content. This feature is also very important to prevent all possible tampering that the medicine could suffer, for example if and when children drop it. Secondary packaging: it meets the need to connect the packaging with several information which guide the user in the approach to the medicine. Tertiary packaging: the identification. Packaging has to make the medicine recognizable as such, among other different product categories and other medical products as well. Moreover, the type of product must be considered in the production process of the pharmaceutical packaging. In fact, medicines are divided according to their form: liquid, solid or mixed; this influences the choice of the material and the shape of the package. Let's start from the beginning. A pharmaceutical packaging prototype dates back to a few centuries ago, when printing didn't exist yet and packaging was made in an artisanal way. The graphic design of the packaging used especially handwriting to describe products, to draw consumers' attention and convince them to purchase. However, it seems that the Japanese were the first who used an attractive packaging, employing leaves as wrapping paper to package their products. 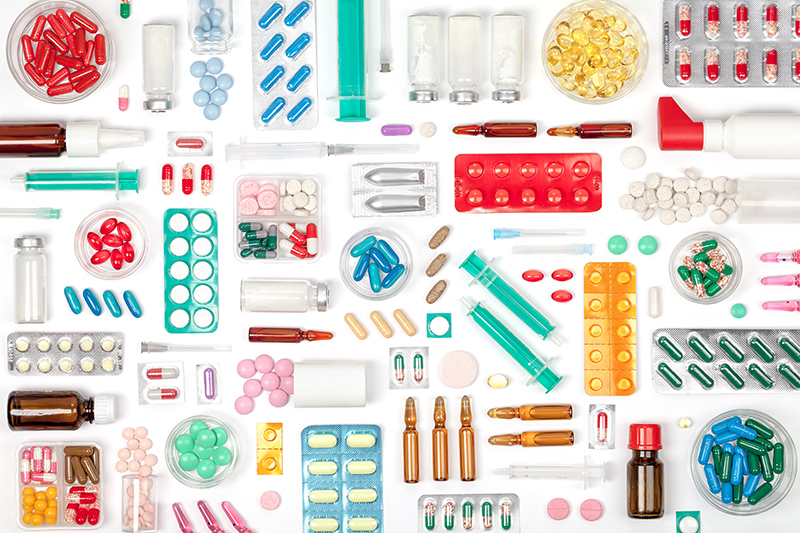 Pharmaceutical packaging is an industry where the graphics play a key role. In a reality in which pharmaceutical advertising constantly evolves, both advertisers and designers who deal with packaging should always keep up with the latest trends. The designer must then prepare a personalized packaging for the medicine, able to make it recognizable and to give it its own identity. The identity expressed through the packaging is also necessary to convince the consumer about the quality of the product, as well as distinguishing it from competitors' products. However, the designer does not always achieve his goal: in fact, a packaged product may leave the consumer indifferent, confused or even hostile. Therefore, an expert must be able to foresee the reactions of consumers and develop a coherent and efficient packaging. First, the image of the product and the company must be studied and checked periodically to optimize the packaging (and thus sales). The goal is to strengthen both the specific product and the brand in general, so that they go hand in hand with market trends. Usually the name of a medicine must not be easily confused with another one. However, it often happens that new medicines adopt a similar name or recalls an already known one to "lean" on the success of the leading product. Graphics are an essential tool to develop a good pharmaceutical packaging to promote the product and the brand to the consumer, but also to doctors and pharmacists. One of the key elements is the choice of images, fonts and colours. However, it's important not to overdo too much colored or impacting graphics to avoid that the consumer can have a distorted view of the medicine itself. To protect the product and facilitate its proper conservation: the aim is the best protection of the product and for this reason there are anti-counterfeiting seals and other closure systems on the packaging to keep the integrity of the medicine by avoiding the contamination by external agents. An efficient resistence to external environmental conditions: a good primary packaging must first protect the product from light and air. To allow a clear identification of the medicine. To indicate all information needed by law. The security aspect is the most important of all. The patient and its security always come first, so a clear, immediate and safe communication is always aimed. This data should be indicated not only on the single package but on all the sides of the multiple packaging (or secondary packaging). By doing so, those involved in storage and management of medicines can easily recognize a product among many others. The expiration date must be specified by law on the product packaging. The date on the box is usually applied using an ink in low relief. However, this feature may compromise the legibility for the consumer. To solve this problem, the European legislation has taken some measures. For example, pharmaceutical companies are required to recheck the packaging before the sale of a medicine to detect packaging defects or mistakes in the expiration date. You have to remember that quality is not always up to the used packaging. In fact, an original and attractive packaging may offset or hide a low quality content. To avert this possibility, those who study the packaging of pharmaceutical products should always seek a balance between aesthetics and quality, but also between quality and price. Therefore, we have understood how the choice of the right packaging, necessarily together with the quality of the product, can considerably influence the sales and the brand image. The pharmaceutical pakaging usually aims for a clean design, the prevalent use of white as background colour which is associated to words such as purity and sterility. Readability must be very clear with essential information, respecting specific standards. Colours often go hand in hand with dosages, they are associated to different doses: cold and weak colours are used for medicines with a light effect, while warm colours refer to stronger actions and higher dosages. Images, medical illustrations, photos of pills or pictures of chemical elements such as molecules are used according to the target. A product for children will have a more colorful and vivid design, while for a medicine for adults the graphics will be minimal and essential. The innovations of this industry are due to the need of working on the brand, a situation which has quite recently changed. In fact, it comes from the introduction in the market of generic products which replace big brands products which have been sold in a situation close to monopoly up to now. It's important to know that all changes made to the packaging must be approved firstly, through the authorization of the Ministry of Health. For this reason, process slowdowns are inevitable. In fact, several rules are imposed and must always be followed. Some new entries in this field also aim at fighting against counterfeiting: new working tools and methods, as well as reviewing the layout of price tag and the thickness of boxes. Many news for the future will also concern QR Code and home automation. The problem also concerns USA which will make the serialization compulsory and will require the implementation of the Track & Trace process without interruption by 2023. Dispenser Burgo Pack: it's a sliding mechanism which ensures the patient every time he takes the medicine with essential information about the product, in a clear and visible way. “Help. I have allergies” by Help Dispenser: this pharmaceutical company provides its pills through square blister packs which differ in colour, each one is specific for the different substances and diseases. “Glowcap” by Vitality: it's a device with an incorporated timer. The cap of the medicine lights up when the product should be taken; if the patient doesnt' react within an hour, an acoustic alarm sounds. Future will be smart also for the pharmaceutical packaging! The project of "smart packaging" starts to be realized: these packages will be able to interact with our devices including smartphone, computer and tablet. In this way, it's possible to detect a wrong conservation of the product, its expiration date and notes which can help the patient to comply with the therapy correctly. “PhutureMed” by Palladio Group: it's a support packaging for patients to monitor and comply with their therapy. This project includes a "Smartbox" equipped with a display and integrated sensors designed to allow the patient to register the time of ingestion of the medicine so that he can constantly monitor his own therapy. Moreover, through its sensors, the device can detect possible jumps in temperature suffered by the package, indicating if the quality of the medicine is at risk. "Phill Solution" is a special box printed through conductive inks. The use of these special inks allows the box to directly "interact" with the patient's smartphone in order to monitor the correct ingestion of the medicine. The device is addressed both to patients and their families. Moreover, a real "reminder" is incorporated in the package itself. Besides smart packaging, there's also the eco-friendly pharmaceutical one! Woolcool is an innovative product, whose element for thermal insulation is the waste wool. It's 100% made of sheep wool, which is a renewable, biodegradable, sustainable, natural and compostable resource. Many other innovations come from italian companies, such as the possibility to read the patient information leaflet through the use of the QR Code, offered by Angelini. Stocksmetic has developed a specific and complete line focused on pharmaceutical packaging. Pharma Collection is made of a wide range of products including glass bottles, pills jars, airless bottles and also accessories for the perfect packaging of your pharmaceutical products. Among the accessories of the collection, there are caps and covers, dispensers and spray pumps, droppers and much more, available in various materials. These products allow you to create the most functional and perfect packaging according to your needs. Learn more about Pharma, our new pharmaceutical packaging line. However, don't miss our exclusive ideas! Design your own customized label and complete your line with boxes to have a complete and unique finish! Check our website and contact us for any information. Our team is always willing for clarifications, to help you in the choice of the perfect packaging and to help you to create your custom-made line.